As the weather has been getting colder, it’s definitely put me into a soup making mood/mode! 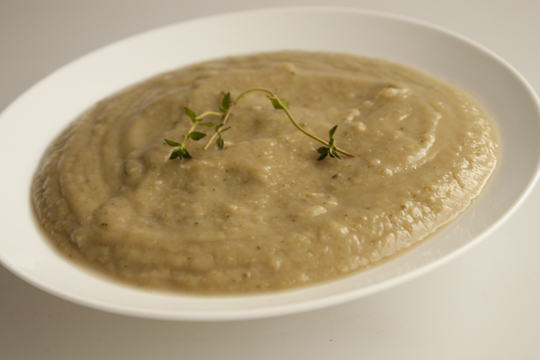 Here is a delicious soup that features roasted chestnuts and broccoli which I hope you will love as much as I did. Recipe info/allergen info: This recipe is gluten-free, and can be made dairy-free by using coconut oil instead of butter or ghee. It can be suitable for those who follow a vegan or vegetarian diet if veggie broth is used instead of chicken broth. First roast the chestnuts: Pre-heat the oven to 180 degrees C. Then prepare each chestnut by using a sharp knife to cut an ‘X’ on the top side of each one. 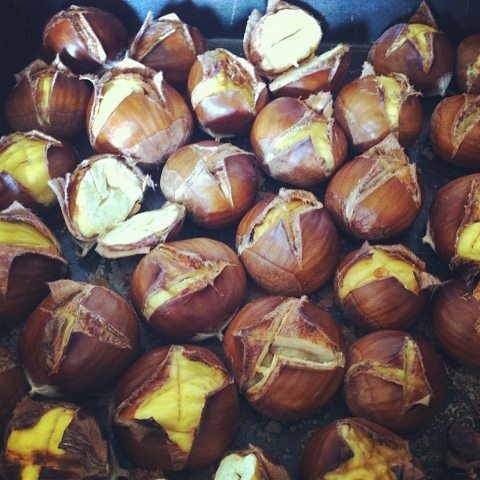 Place the chestnuts on a baking tray and cook for 15-20 minutes or until the shells start to peel away from the chestnuts (See the picture below of the roasted chestnuts). Then take them out and put each one in a tea towel (so you don’t burn your hands) and use the tea towel like a glove to completely peel the shells off the chestnuts. This can be done a few hours before hand, if you like. 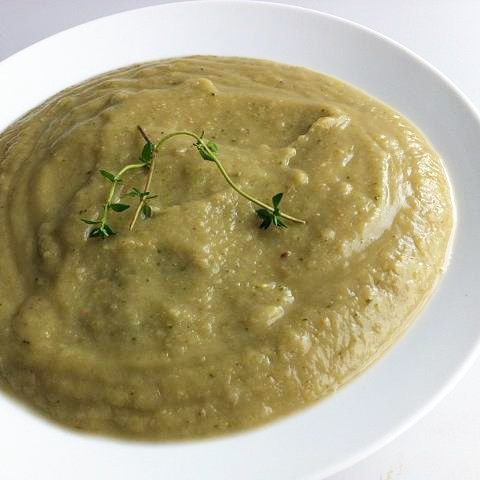 When you’re to cook the soup: prepare the veggies– Wash and chop the celery stick into chunks. Peel the onion and chop it roughly and wash the potato and chop it roughly. Peel and chop the garlic. With the broccoli wash it and chop the stalk of the broccoli into small pieces (the florets can be a bit bigger because they are more easily cooked). Cook: Heat your oil of choice in a pot and cook the above veggies for a few minutes on medium heat. Add salt and pepper to taste. Add the chestnuts: Now roughly chop the chestnuts. Add the chestnuts to the veggies and then add around 3.5 to 4 cups of veggie broth or chicken broth, depending on how thick or thin you want the soup. Add the thyme leaves and put the lid on the pot. Leave to cook on medium-low heat or until everything is really soft. Then using a stick blender (or a normal blender in batches) blend the soup until it has pureed. You’re so creative Michelle! I’ve never tried or cooked with chestnuts; are they similar to other nuts in omega 6 content, fats etc? I try to steer clear of too many nuts on the whole (but LOVE them!) so i’d be interested to know more about the nutritional break down. Oh thanks Catie :). This was actually the first time I’ve cooked with them (but not the first time I’ve eaten them). That’s a great question. When I wrote this recipe I did actually look up the nutritional specs for chestnuts, but I haven’t been able to find very much information at all … However I did find this info from Nutrition Data: Chestnuts- http://nutritiondata.self.com/facts/nut-and-seed-products/3143/2 where it says there is 1110mg n6 per cup, which compared to almonds (21223mg n6 per cup http://nutritiondata.self.com/facts/nut-and-seed-products/3088/2) is much lower. I love nuts too!